Each winter, cities throughout the Midwest scramble to salt sidewalks, driveways and roads. That quick fix, coupled with the wide use of inefficient water softening systems, creates a huge impact “downstream” on the water in our communities: excessive levels of chloride (a component of salt) in our lakes, streams and, ultimately, your home’s water. So, what does that mean for you and how can you help soften the impact on your family? Here’s the scoop on chloride reduction and how more efficient water softeners can help lower excessive levels of chloride in water throughout your home and community. At its core, chloride reduction is the process of reducing salt levels in our water. As we spend winters salting our streets and all year adding salt to water softeners, we create excessive levels of salt in our local water. The salt eventually makes its way back into our homes, impacting our families and, essentially, our daily lives. Each year, cities across the United States get millions of pounds of salt in their water systems from road salt, water softeners and other sources. For context, the wastewater treatment plant in our backyard of Madison, Wisconsin, receives 80 million pounds of salt annually! Wastewater treatment plants are not designed to remove chloride, so all the chloride that goes down the drain ends up in local fresh water bodies. A study conducted by the treatment plant found that if residents enhanced their water softeners to be as efficient as possible, an estimated 27 percent of chloride levels could be reduced. Additionally, water softener salt use could be reduced by 48 percent by simply replacing old or inefficient softeners with more efficient softeners. Hellenbrand offers two core products that address chloride reduction, helping you achieve healthier water for both your family and the surrounding community. Hellenbrand’s ProMate EcoMax helps address the environmental impact of excessive chloride by providing more than 5,000 grains of capacity per pound of salt used, making it over 40 percent more efficient than most systems on the market. In other words, it gives you many more miles per gallon of water. And by using less salt, the ProMate EcoMax reduces chloride levels in your water and community, helping you be environmentally friendly while saving money on maintenance. Our most efficient water softener, the ProMate EcoMax Duo twin tank system uses smart technology to seamlessly regenerate softening cycles. By using 100 percent of the available capacity before switching to its second tank, the softener saves an additional 17 percent of water and salt. Basically, the Duo offers the greatest efficiency for bigger households. Think, the bigger the home, the more water you use (and water capacity you need). The Hellenbrand family has been dedicated to answering family water problems for over 50 years. 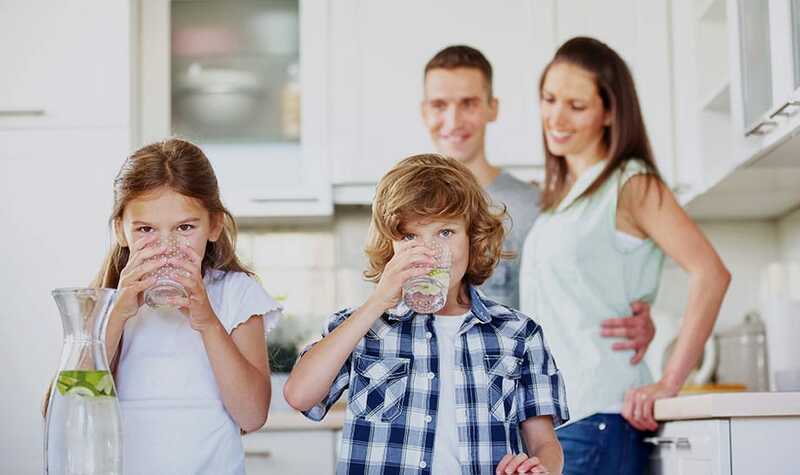 We spend our time focused on creating innovative water systems, which are backed by a national network of dealers to help you understand exactly what’s in your water.